This article describes how to start, join, and share games on Tabletopia. On Tabletopia, you can create your own rooms or join game rooms created by other players. Start a new game if there are no suitable games for you to join in Find & Play. Go to All Games. Use filters to sort the games by genre, age, number of players, time, or language. After finding a game click More Info in the game box. You will be redirected to the game’s page. Click Play Online. The game room will be created and the game lobby will appear. Click Start to launch the game. If there are not enough players for the setup you chose, you will be able to change the setup or continue with the chosen setup. You can play solo, if solitaire mode is available, or wait for other players to join your room in Find & Play. Or you can invite other Tabletopians and even your friends who are not registered with Tabletopia to join you. Click Invite players in the game lobby. 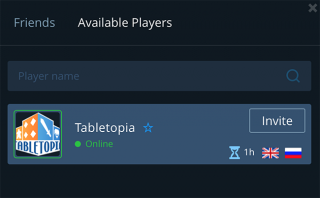 Select “Friends” to see your Tabletopia friends list or select Available Players to see other players now online. Click Invite next to the users you wish to join the game. To invite people outside Tabletopia, copy the link to the room and send to them. They will be able to join the room in a browser. It’s free. You can post the link to your room on the general chat in Find & Play to let people know you’re looking for opponents. You can make your room open to friends only or specify language, game level, etc. 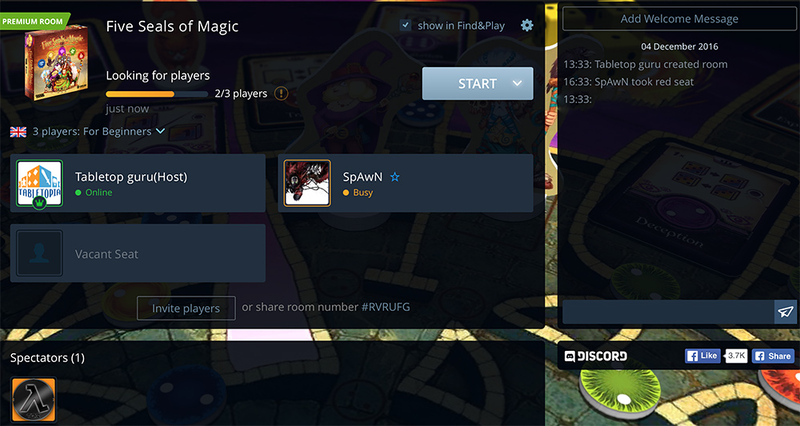 To make your room visible to other players, select “Show in Find & Play” option in the game lobby. Click in the game lobby. The Settings window will open. Specify chat language, voice talk option, and game level to let other players know your requirements. 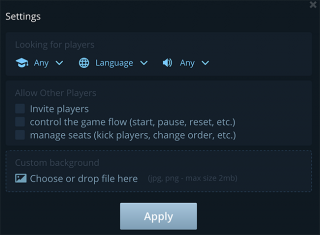 Specify what other players besides the Host can do in the room by selecting options in the Allow Other Players section. If you have Premium, you can also change the game background image. You can specify additional information about your room, such as game starting time, etc, in the welcome message. Click Add Welcome Message in the game lobby to enter message. To delete the room, click Close in the upper right corner of the lobby > Yes. The room will be deleted. Note that simply shutting the game lobby window will not remove the room from Find & Play. You need to delete the room manually. You can switch to another game without leaving the current lobby. No need to create a new room. Hover the cursor over the game box image in the lobby and click Switch. 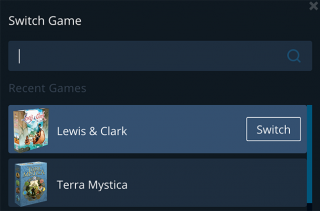 Find a game using the Search field or select a game from the list of your recent games, if available. Click Switch. The new game will appear in the lobby. All open rooms created by other players are visible in the Find & Play section. Go to Find & Play. Click Lobby, or Details > Join Game, or click a seat to join an open room. The game lobby appears. Wait for the room host to start the game. Enjoy!